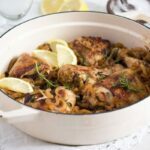 Tender chicken and caramelized onions – this is a beautiful African chicken stew recipe, the Senegalese poulet yassa or yassa chicken. Another African recipe for you today. I don’t have too many African recipes on my blog, but those that I have, I love. Have a look at this Nigerian Jollof rice, which has become a regular in our house or this Somali Corn in Coconut Turmeric Sauce, which I definitely have to make again soon. I’ve actually intended to make another Senegalese dish –Thieboudienne – a recipe I have cooked several times many years ago. It was a dish I cooked for my husband, who was the first to ever tell me about it. When he was younger, a couple of years before we met, he spent several months in Senegal, in the house of a common wood worker. They worked together all day long making drums and ate thieboudienne every evening. For the entire time he spent there, my husband never ate anything else. Every evening there was thieboudienne and at the weekends they would eat another version of the same dish made with meat instead of fish. My husband liked it very much and when I started cooking myself, he told me about it and asked me if I could cook it. I wanted too, but as soon as I saw the recipe, I knew I couldn’t. Same reason then, over 10 years ago, as now: ingredients like cassava root are not something you can buy in Germany, at least not here where we live. So, I let it be until we moved to London, which is a paradise on Earth when it comes to food. Thieboudienne was then one of the first dishes I cooked in our London kitchen. I would love to eat it again, but as I seldom come anywhere near any shop selling such exotic food as cassava, this dish will have to wait again. 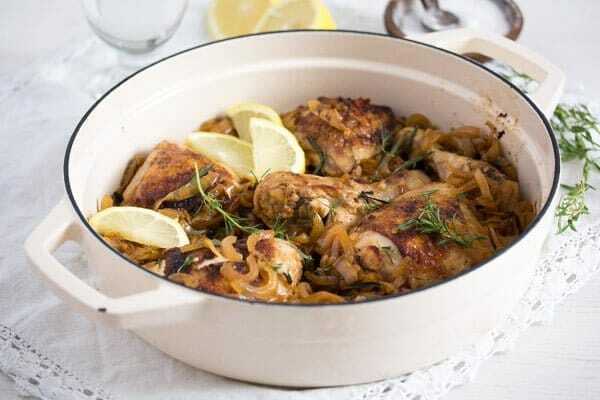 Yassa chicken or poulet yassa, originating in the Casamance region in the South of Senegal, is a dish that has become popular not only throughout West Africa, but outside Africa as well. Yassa is actually a dish which isn’t cooked only with chicken. You can make a yassa dish with lamb or fish as well, poisson yassa – fish yassa being a rather well-known Senegalese dish as well. 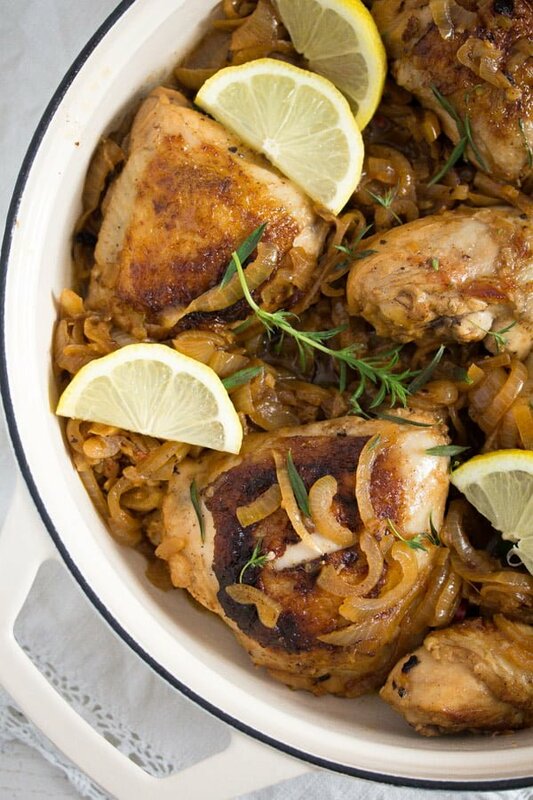 Poulet yassa consists of moist and tender chicken pieces, marinated overnight with lots of onions and lemon juice, which helps tenderize the meat and gives it an incredible aroma, this yassa chicken is definitely a dish that you have to try. The chicken gets marinated for so long in an attempt to tenderize the rather tough African chicken. You might think, in this case, that an European or American chicken will not need such a long marinating time, as our chickens are always tender. But I do recommend marinating the chicken with the lemon juice and the onions. You might get away with a shorter marinating time, but do let the chicken marinate for at least 4 hours. This will not only make the chicken more tender, but will also give it a wonderful flavor. The marinade contains habanero/ Scotch bonnet peppers. They are really hot, so do adjust the quantity according to your heat tolerance, I’ve personally never managed to use more than half a small Scotch bonnet and even that amount was too much for the children. When making this Senegalese Chicken Stew again I left the exotic chilies completely out of the dish, replacing them with the more common red chili sort, which is widely available in any supermarket. The dish was not so spicy anymore, but the children were able to enjoy it as well. And they did enjoy it, anything with chicken is a winner! After marinating the chicken, the chicken parts are grilled or pan fried. After that you will cook the onions until they start to caramelize. Then you will give the chicken back to the pot and continue cooking the stew until the chicken is perfectly cooked through and the onions soft. 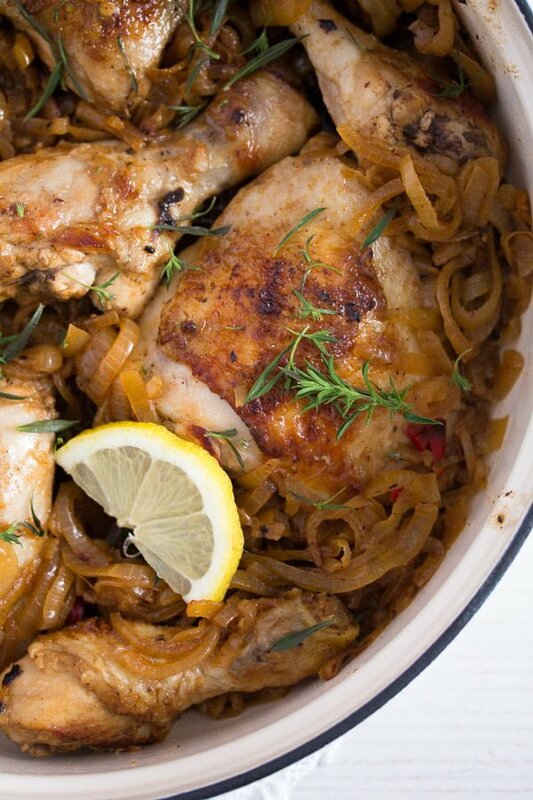 The Senegalese Chicken Stew – Yassa Chicken is served with rice. The dish can be made in advance and reheated, I have done that and it works perfectly. Halve the onions and slice the halves. Mix the fresh lemon juice, oil, mustard, grated garlic cloves, bay leaves and salt together. Halve and deseed the chili and give it to the marinade as well. Mix the sliced onions with the marinade. Cut the chicken legs at the joint (if using whole chicken legs) dividing them into thighs and drumsticks. 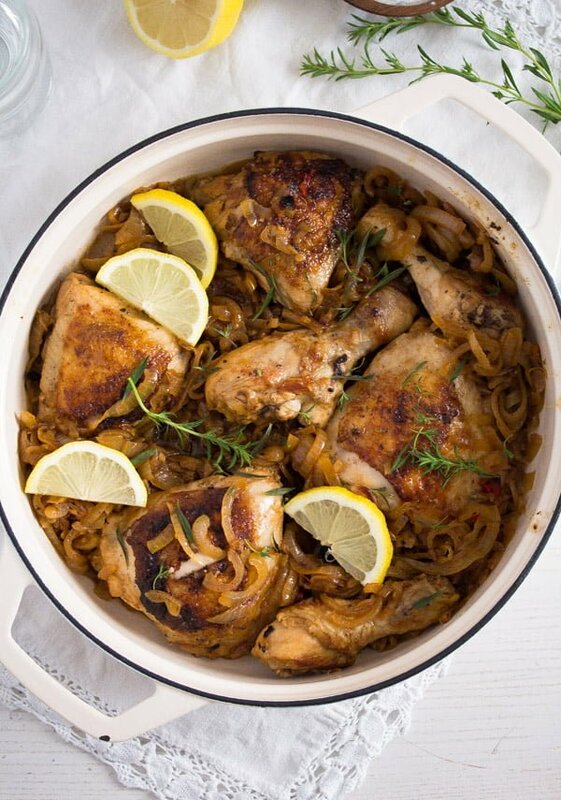 Give half of the onions to a large glass casserole dish (or another large non-metallic container, large enough to hold the chicken and the onions). Place the chicken on top and cover with the rest of the onions. Cover the dish with cling film/plastic foil and refrigerate for 4 to 12 hours. 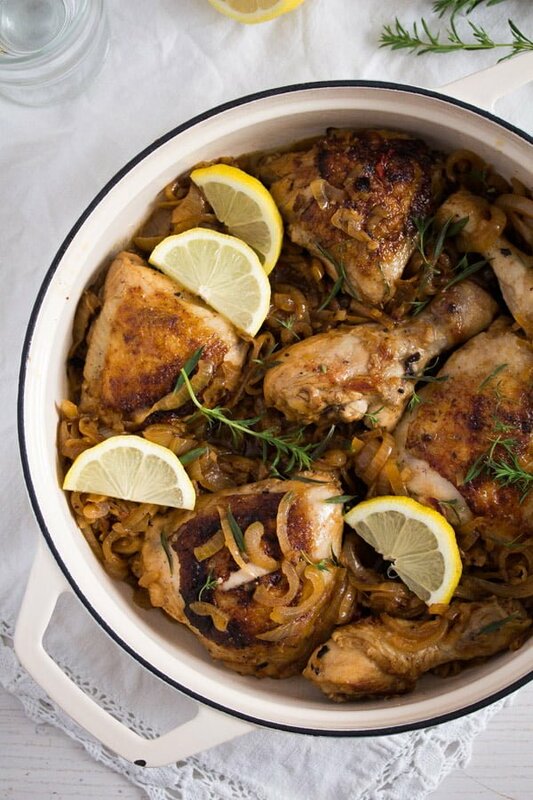 Take the chicken out of the refrigerator about 30 minutes prior to cooking to allow it to come to room temperature. Heat the oil in a large Dutch oven or heavy bottomed pan. Fry the chicken on both sides until golden, about 5 minutes on each side. Remove from the pan. Remove the habanero/ Scotch bonnet from the marinade and discard it. Give the onions and the marinade to the pot and cook the onions for about 5 minutes. Cover the pot and continue cooking the onions for about 15-20 minutes or until the onions are soft and start to caramelize. Give the chicken back to the pot, making place for it between the onions, turn it a couple of times into the sauce to coat and add the chicken stock. Bring the food to a simmer, cover and cook the chicken for about 20-25 minutes or until cooked through. If you stick a toothpick into the thickest part of the chicken thigh the juices should run clear. If the juices are still pink, continue cooking the stew, checking again from time to time until the chicken is cooked through. Note 1: If you cannot get hold of the habanero/ Scotch bonnet you can replace it with regular chili peppers to taste. Keep in mind that habanero/ Scotch bonnet are very hot, so adjust the quantity used according to your taste.Note 2: Whole chicken legs are commonly sold in Germany. I usually divide them at the joint before cooking. 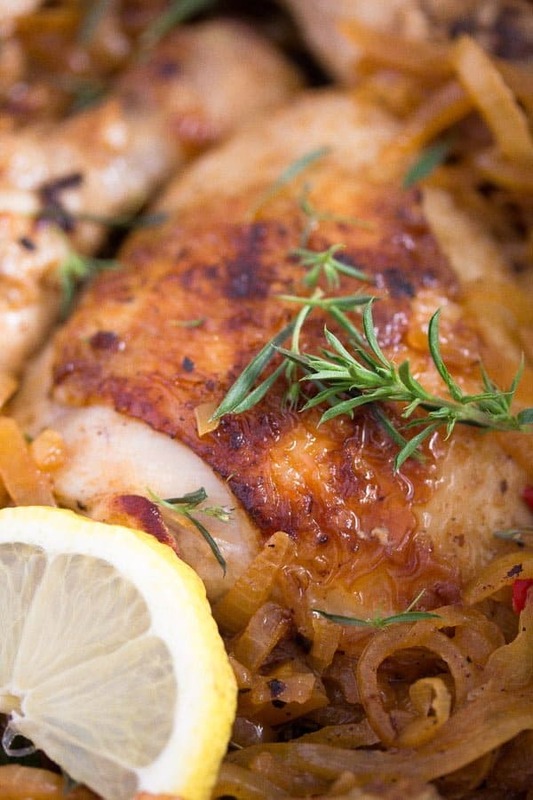 You can also use only chicken thighs, or a mixture of chicken thighs and bone-in, skin-on chicken breasts. Use 4 or 6 depending on how large the chicken legs are, in Germany the size can differ very much, depending on where you buy the chicken.Note 3: You can use chicken stock made from a stock cube, common for African food is the use of maggi stock cubes. Sounds wonderful! 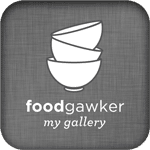 I’ve never cooked anything from this part of the world I think, but I have several cookbooks and many many bookmarked recipes on the web…. Many shops in my city sell African vegetables (such as cassava), so I should really profit from the chance I have!